"Somewhat Fair But Unimpressive and Superficial"
THE BRINK is a documentary that follows one of Donald Trump’s more controversial advisors, Steve Bannon, during the 2016 campaign and afterwards, including Bannon’s trip to Europe to help conservative, populist political leaders there. THE BRINK is one of the more fair liberal/leftist documentaries, but it still could use more depth and greater understanding of the person and issues it addresses. Extreme caution is advised for that shortfall and excessive foul language. The movie opens with Bannon strategizing with people on a cell phone as he scarfs down a Red Bull. It moves on to Fall 2017 when he was fired by the Trump administration and decided to take his campaigning expertise overseas to Europe. THE BRINK continues to follow Bannon as he makes speeches and interacts with people in Europe and the United States. Interspersed with this are highlights of Bannon during the 2016 presidential campaign when Bannon and other advisors helped Donald Trump win a stunning electoral victory. 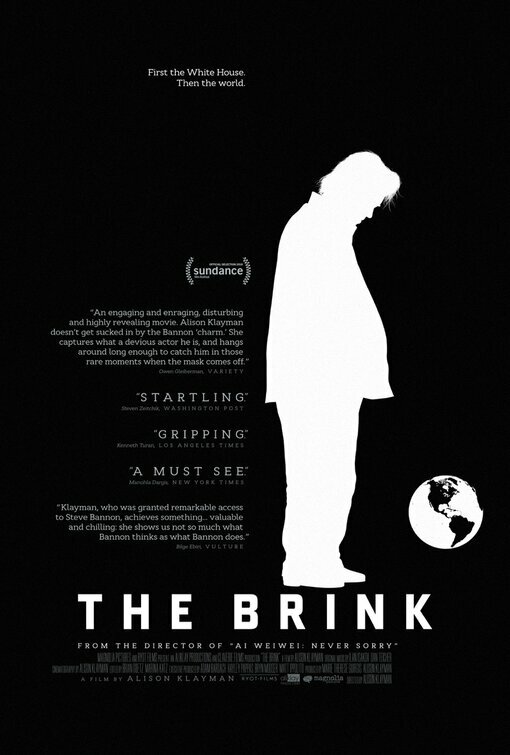 THE BRINK is one of the more fair liberal/leftist documentaries in recent years. The camera pretty much just follows Bannon around, letting him have his say. One scene toward the end, however, shows Bannon being challenged by a reporter from the left-leaning British newspaper, The Guardian. The reporter says some of the European populist groups and leaders Bannon’s meeting have racist, white supremacist views. Bannon fails to effectively defend the groups and just seems to deny the reporter’s claims repeatedly. That said, the Guardian reporter fails to support his claims with sufficient factual information that would back up his assertions. Which leads to the ultimate judgment concerning this movie. The main problem with THE BRINK, besides the unnecessary foul language coming from Bannon, is that it fails to offer viewers a really in-depth, insightful discussion of the social, political and economic ideas that fuel Bannon’s philosophy and ideology. THE BRINK is mostly a superficial kind of documentary whose main desire is simply to let Bannon hang himself. Bannon sometimes does that in the movie, especially if, like many if not most liberal and leftist pundits, you’re ready to pounce on and exaggerate every little thing Bannon says. MOVIEGUIDE® advises extreme caution for lack of real insight and the foul language in THE BRINK. Man gets angry at a subordinate. THE BRINK documentary follows one of Donald Trump’s more controversial advisors, economic nationalist Steve Bannon, during the 2016 campaign and afterwards. The movie opens with Bannon strategizing with people on a cell phone as he scarfs a Red Bull. It moves on to Fall 2017 as Pres. Trump fired Bannon, and Bannon decided to take his campaigning expertise to populist leaders in Europe. THE BRINK continues to follow Bannon as he makes speeches and interacts with people in Europe and the United States. It includes highlights of Bannon during the 2016 presidential campaign when Trump won a stunning electoral victory. THE BRINK is one of the more fair liberal/leftist documentaries in recent years. The camera pretty much just follows Bannon, letting him have his say. However, THE BRINK fails to offer a really in-depth, insightful discussion of the ideas fueling Bannon’s philosophy and ideology. Ultimately, THE BRINK is a superficial documentary. Its main desire is simply to let Bannon hang himself. Bannon sometimes does that. MOVIEGUIDE® advises extreme caution for the lack of real insight and the foul language in THE BRINK.